Thousands more years pass before the wandering Time Lord known only as "The Doctor" (portrayed in this adventure by Tom Baker) accidentally arrives on the Ark, along with his travelling companions Sarah Jane Smith (Elisabeth Sladen) and Harry Sullivan (Ian Marter). 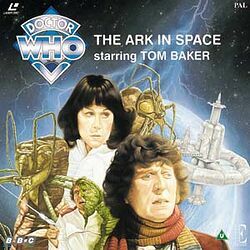 First broadcast in early 1975, The Ark in Space was the second Doctor Who story to feature Tom Baker in the title role. Partly as a budget-saving measure, the story formed the start of a short four-story arc which followed the Doctor's attempts to recover his time/space vehicle, the TARDIS. The concluding story, Revenge of the Cybermen, was set aboard the same space station, but many years prior to the great Solar Flare which destroyed life on Earth. Originally written by John Lucarotti to feature an alien colony of fungal creatures called the Delc, the story was hurriedly re-written by script editor Robert Holmes when it became apparent that the story line was to [sic] complex and ambitious for the programme's budget and target audience. As it turned out, the finished result was a remarkably thought-provoking tale which provided the series with one of its most memorable adventures, and the BBC with a sure-fire ratings hit for its brand new Doctor.